Specialty or “fancy foods” are generally premium quality products, often made by artisans and small producers. Think: Specialty chocolates, olive oils, cheeses, sauces, snacks, charcuterie, coffees, and imported products that reflect diverse cultures. Also included in the category are the growing number of all-natural and/or gluten-free foods, and exotic handcrafted products like vegetable yogurt, cherry chia granola, and black garlic mayonnaise. In NYC, food fanciers typically find these products in small delicatessens; specialty shops, like Dean & DeLuca and Trader Joe’s; and select supermarkets like Whole Foods and Wegmans. Earlier this week, we visited the 2014 Summer Fancy Food Show, a trade event held at the cavernous Javits Center in New York. Imagine a venue that can comfortably accommodate more than 2,700 food producers and importers—in addition to more than 20,000 buyers who come to see what’s new and different. With exhibits from more than 50 countries, 10 state pavilions, and individual producers, a trip around the floor of the convention center was the next best thing to taking a culinary tour around the world. We were able to talk to exhibitors about their products and taste samples (mostly cheese, chocolate, and pieces of bread dipped in oils) along the way. The highlight of the event is the sofi Award ceremony (which we didn’t attend) that selects the “best of the best.” This year’s grand prize winner was Chef Dominique Ansel, creator of the Cronut, a $5 croissant-donut hybrid that became so popular in NYC that it spawned endless lines and a black market, where they were selling for up to $100 each. An opportunity to sample Thai Beer – Quite delicious! There was also a feel good element to the show: To give back, at its conclusion, 200 volunteers gather up the remaining food products and donate them to City Harvest, filling more than six tractor trailers with food for New Yorkers in need. TJ Maxx (source of my favorite fig jam) is considered a major retailer for these upscale products. Note to self: Check the shelves for the foreign products I wish I had brought home during our travels. Specialty food consumers tend to be young, affluent and live in the West or Northeast although nearly ¾ of U.S. consumers purchase specialty foods. A survey of consumers reported that food discoveries made during travel are increasingly prompting purchases. Greek and Mediterranean foods have made the most gains in sales among ethnic cuisines. There’s been an increase in the popularity of snacks and small meals (vs. large meals) among American consumers. After years of legal disputes, Gruyere is now a registered trademark and can only be used for the Swiss product. Another reminder to myself: Buying less more often is a healthier way to eat with less waste. Some 40% of specialty food consumers make their purchases online. One last note to self: Check out www.dartagnan.com if you are crazy about foie gras. Never drive to the Javits Center. It took one full hour to find an overpriced parking spot in a garage! Are there any specialty or “fancy foods” that are favorites of yours? Great article. Learned a lot about various foods and where to buy them. About not driving to the Javits Center – – – – For most shows, I’ve learned that there is a free bus right outside Penn Station that takes you directly to the center. It’s supposed to be for the media/press folks, but I observed other people hopping on when I attended the book show. Sure saved me lots of walking, the expense of getting into a taxi, or driving there with my own car. I agree that it’s not wise to take one’s own car. Thanks, Irene, for all the information. That’s a good travel tip about the shuttle bus. We actually wound up in a parking garage so far away, we wound up taking one of the buses back to our car! Yum! I see lots of fancy foods I’d love to tuck in my shopping basket! The Javits Center sounds like the perfect place to pick up gifts for a special foodie friend as well. The Fancy Food show sounds wonderful. And a bit overwhelming. I will check out what I can find at TJ Maxx when I’m back in Arizona this winter. 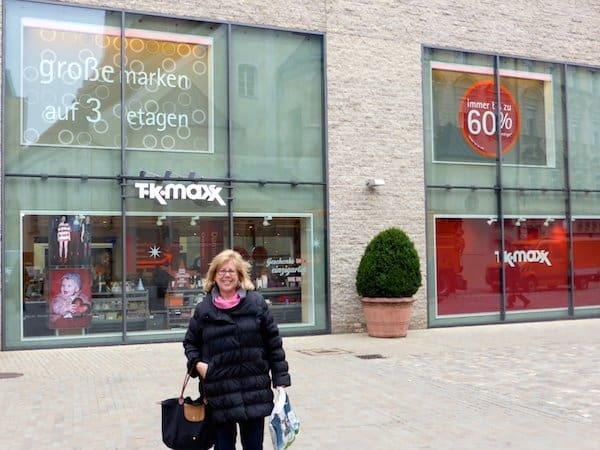 I don’t know where you are, Donna, but I found out there are TJ Maxx’s all over! The man with the Spanish ham reminded me of all the “pig trotters” you see in supermarkets and small upscale places in Spain. The first time I saw one I was horrified but over time I got used to it. This one is less anatomically shocking than the ones in Spain! I’m dumbfounded that someone would pay $100 for a “cronut” but then they might be horrified at what I spend my money on! Interesting piece – thanks! To add insult to injury, you have to wait on line to buy that cronut, too! I always wanted to go to the Fancy Food Show- never made it and now I’m too far away. It’s making my mouth water. When you go to these events, you’ll have to eat for both of us! They have summer and winter shows, Billie, so there is always another chance! Wow, I would love to check out this show one of these days and have a total foodie fest. Loved all the wonderful stats and facts you added in the end Irene. The Fancy Food Show always has so many interesting thing. Love the stats! Back in our former lives we owned a French restaurant for 16 years and for many years we’d attend food/restaurant shows and they were the best! As a side note: I find it pretty humorous that TJ Maxx is an outlet for fancy foods?! I’ve always taken TJ Maxx for granted as a clothing outlet in Salt Lake City. I haven’t seen any fancy foods, I guess I’ll search a bit closer next time. I’m drooling for a Cronut, that $5 croissant-donut hybrid. An interesting combination. What a wonderful way to virtually tour around the world without going anywhere (other than struggling to find a car parking space lol) and sampling all these gastronomic delights! I’m trying to picture 2,700 food producers,importers and their colorful wares as well as the 20,000 buyers (hopefully not all at once!) under the same roof… Sounds like an assault on the senses but I’d sure like to sample some of the offerings! Amazingly, the space was so large and well-divided that you didn’t feel crowded at all. I love checking out the food products at TJ Maxx. I love finding unusual jams and spreads. I also love european cheeses. This sounds like a great show! As avid foodies, we would have LOVED this!! This looks like so much fun. i don’t know much at all about fancy foods so this would be a definite learning experience for me. It looks like a lot of fun and 50 countries being represented is amazing! It’s a quick education for any visitor, Michelle! Irene S. Levine wins first-place SATW award!